Located in Cleveland, Ohio is the Morgan Conservatory. 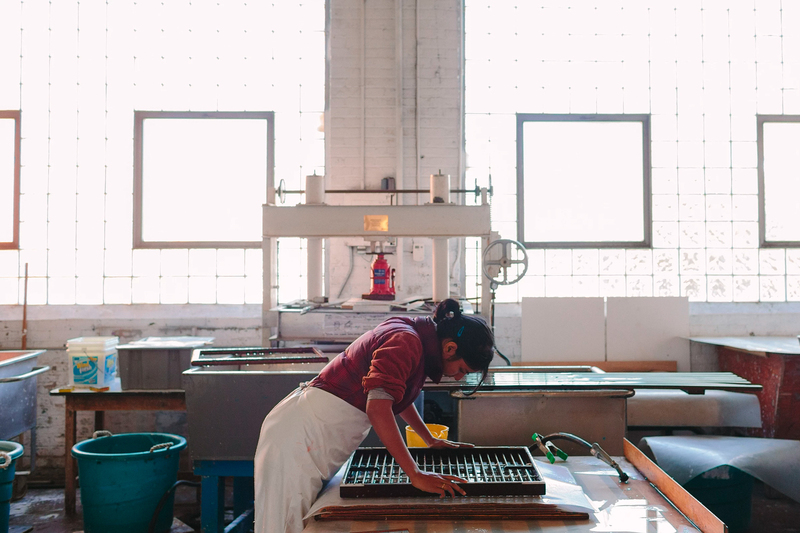 It is the largest arts center in the United States dedicated to every facet of papermaking, book arts and letterpress printing. If that’s not enough, it also helps cultivates the talents of established and emerging artists through its gallery and studio spaces. An international destination that is free and open to the public, the Morgan Conservatory is a working studio, gallery, gathering place for the community, educational hub and purveyor of some of the finest handmade papers in the world. When introduced to the Morgan Conservatory’s new Translucent Abaca Paper made by Tom Balbo, we knew it would be a great addition to our product line up. Abaca is sought after for its thinness and its strength. Abaca is the Philippine word for Manila hemp which is the fiber that comes from the stalk of a special type of banana tree. Interestingly enough, this fiber is most extensively used in the United States as tea bag paper! The thin and porous properties of the abaca fibers make for great teabags, but also a superb paper used for art, printing, and bookmaking. Abaca paper has become very popular with book binders, crafters and printmakers for a number of reasons. It prints and folds beautifully and leaves a light crease mark. The fibers “wet strength” allow for the artist to pick up a wet, newly formed sheet of paper and to manipulate it into any shape without tearing the sheet. These properties also make it great for using in chine colle and collage. The abaca used at the Morgan Conservatory is rinsed two or three times in the natural and bleached form before beating. For comparison, many other fibers are only rinsed one time. The paper is then beaten for roughly 3-1/2 hours! The longer beating times produce a wonderfully crisp and translucent sheet. Once the pulp has been beaten, it is used in its natural form or it is pigmented using Ardvard black and other aqueous colors. Since the abaca fibers retain moisture so well, the drainage time of each sheet can be more than 5 minutes! They are couched on an alternating felt and pellon side and also restraint dried. The photos show the current selection that TALAS proudly stocks.